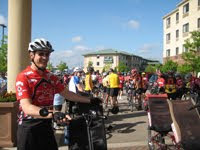 We had a 7:00 a.m. ride start this morning as breakfast at our hotel started late but it was worth waiting for. Our start temperature was in the low 50’s which was a slight change from what we had been used to but warmed up into the 70’s by ride’s end making for a beautiful ride. 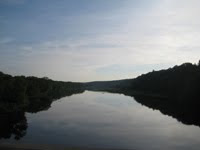 We saw lots of wildlife along the route such as turkey, deer and even a fox. 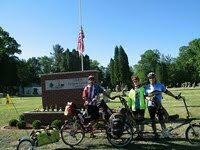 We had planned to rest in Dalbo, MN but came across a Memorial service at the Salem Lutheran Cemetery that was just beginning so we quietly joined the small gathering to pay our respects to those responsible for making our country one we can be proud of. 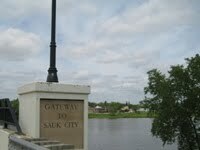 Following the service, many attendees were curious about our travels. 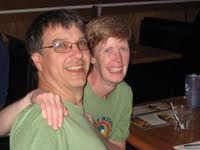 Kathi and John shared their desire to reach Washington State before this journey came to an end and all enjoyed listening to their ambitious plans. 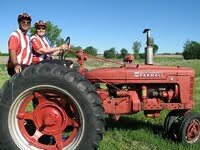 We arrived in Milaca, MN around 10:30 a.m. and Kathi and John were allowed to check in early and invited Dennis and I to wash up in their room before catching our ride back to the Twin Cities. Amy and Luke found us at the Dairy Queen having our usual afternoon snack. Introductions were made and we then had to bid farewell to John and Kathi. 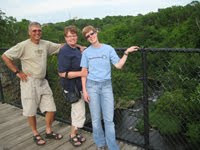 Parting was difficult as we realized our weekend fun was ending and we would not see John and Kathi for some time. We wished them well as they venture west to continue their journey. We are grateful to them for this riding opportunity and have confidence that they will reach their goal. Happy trails guys! 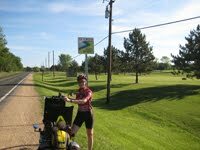 We checked out early from the River Valley Inn and prepared for our bike journey west towards Cambridge, MN for our 2nd night layover. The temperature today was about 20° less than that of Saturday and we had 30 miles of easy riding until the winds picked up and caused us to work a little harder for the last few miles of today’s ride. We reached Cambridge to find the city wrapped in construction. We detoured off the main road onto a service drive to reach our hotel for the night. After washing up, we walked to Culvers for an ice cream treat then back to the hotel to visit and discuss ordering a pizza for our evening meal. Kathi and John mapped their next layover destination, Milaca, choosing to travel light because of the holiday. 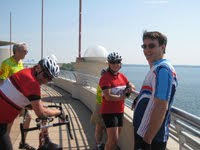 Dennis and I then contacted Amy to allow her to decide if she wanted to pick us up in Cambridge or Milaca. 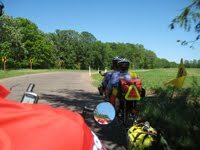 The choice was made to meet up in Milaca which would allow us one more day of riding with the Johnsons. Looks like Kathi and John were stuck with us for one more day. 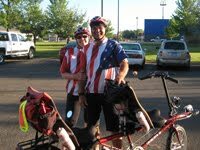 We find ourselves biking with Kathi and John Johnson again this Memorial Day weekend. They have been on the road biking for 12 straight days when they called to let us know they would be in our area and invited us to join them on a portion of their adventure to bike the northern tier across the USA. We met up with them at the Regency Hotel in Hastings, MN on Friday evening and on Saturday began biking towards Osceola, WI where we would be spending our first layover night at the River Valley Inn & Suites. 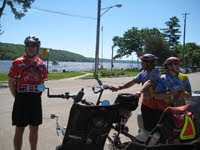 Today’s route took us through Stillwater, MN where we stopped at the Historic Water Street Inn & Irish Pub to enjoy the view of the St. Croix River. 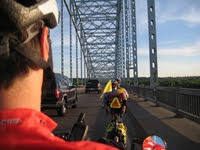 Following our rest in Stillwater, we cued up to join the traffic crossing the lift bridge into Wisconsin. It was a beautiful biking day—blue skies with mild winds. 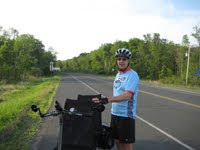 The temperature, however, reached 100° at a time when little shade was available forcing us to pedal on through 30 miles of heat and challenging road surface. We reached Osceola a bit exhausted from heat and hills, jumped in the shower and then made plans for the next day’s travels. Supper was at the Tippy Canoes Restaurant directly across from our hotel and it was delicious. 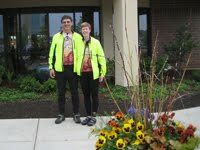 Kathi and John are an oddity out there on the roads and many curious people stop them to question their unusual mode of travel. It’s been exciting to be a small part of their adventure and enjoy the looks of excitement on their faces as they travel through unknown areas of the country. 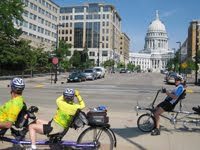 An official ride was not planned for the third day of the rally so we made plans to bike the Madison trails with our wonderful friends Annette and Tom Esser. Paul and Diana Hugo from Spring Lake, MI also joined our small group as we wandered around Lake Monona and Mendota coming to the base of the capital building for a photo opportunity and then onto the University of Wisconsin-Madison campus for more photos—this is such a beautiful area. Our lunch break was at a small Irish Pub on State Street. Our group ate outside under the shade of umbrellas where we could enjoy watching the activity along this historic street of downtown Madison. We then biked back to our loaded vans to pack up after a round of goodbye hugs. We are hoping the Essers will be able to join us in Alabama as we really enjoyed our time with them during this rally. 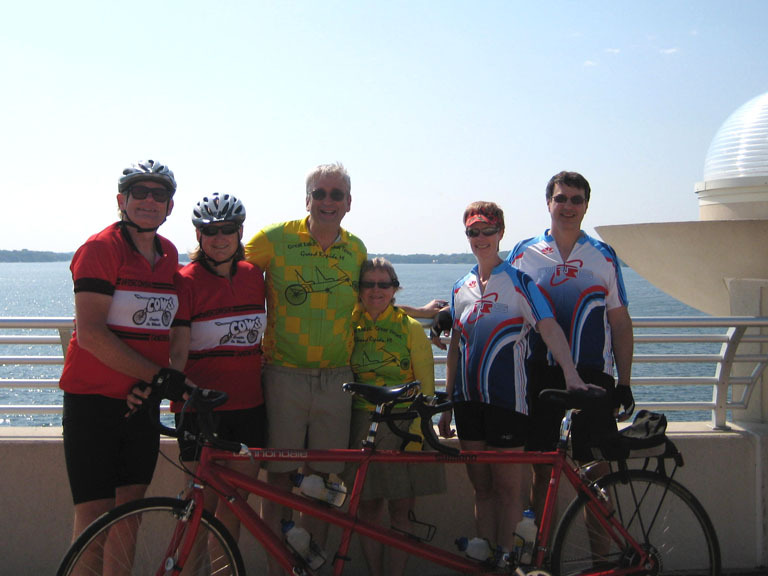 Saying our final good-byes to Kathi and John Johnson as they prepare to enjoy their recent retirement by facing the bike west towards the coast and seeing how far they can get by August. They will have company for a few days as Steve and Michelle Brown will be travelling with them. Breakfast began at 7:00 a.m. at the Marriott. We ate with Kathi & John. While eating, a neighboring table tapped Dennis on the shoulder to ask if they could take a picture of his jersey—we were dressed in our new COWS jerseys today. After chatting with this group, we found out that they were in town for a teacher’s convention but best of all, they were from Tennessee and Rich—the biker in the group—was happy to give us his e-mail with an invite to call on him when we go south for our STR/Natchez Trace trip in October. Rich ended up joining the COWS and purchasing 2 jerseys to take home. 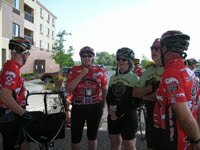 A mass ride start was scheduled for 9:00 a.m. leading out from the front of our hotel so we said goodbye to our TN friends and got ready to ride. 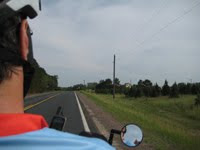 Skies were blue, winds minimal and no rain in sight—a biker’s heaven! 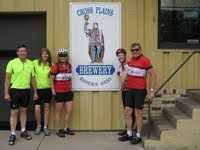 Today’s route led us out of town towards Cross Plains again but then continued north along county roads. Oh, those hills! After completing our ride, Beth announced that we did 2400’ of vertical climb—that’s quite strenuous for early season but the route was beautiful. 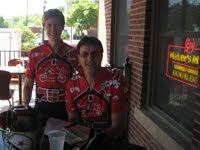 We lunched at the Roxbury Tavern, a local cyclist hot spot. They were flipping burgers as fast as they could to keep up with our crowd. The burgers really hit the spot—or was it just the cold drinks? Art & Deb, Steve & Michelle, Dennis & Ingrid joined Dennis & I at the Roxbury. 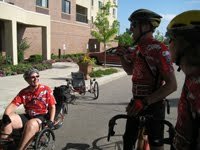 After lunch, Art and Dennis began talking about an annoying squeak coming from the rear of our bike. Art suggested we slide the fender stays away from the wheel. That suggestion gave us a much quieter ride—thanks Art! 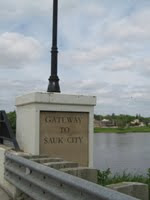 The route then took us through Sauk City/Prairie du Sac—2 quaint little towns along the Wisconsin River. 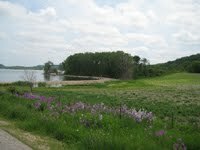 The hill climbs then returned and continued until we exited onto the bike trail that took us back into Middleton. Dennis and I did get rained on for about 2 miles of this journey but it cooled us down and rejuvenated our waning spirits. We made it back to the hotel with a bit of time to rest up before the 5:30 social and 6:30 p.m. banquette/COWS annual meeting. Many COWS gathered for the annual banquette and meeting held at 6:30 p.m. in the Marriott dining hall. We enjoyed the company of Kathi & John Johnson from Dorchester, WI, Steve and Michelle Brown, from Middleton, WI and Brian and Monica. Pasta, salad and dessert were served and a short meeting followed with an initiation of new members which included about 10 couples. 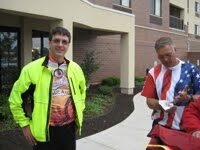 I made an announcement inviting COWS members to join Dennis and I in Alabama for the Southern Tandem Rally. The announcement sparked much interest and it looks like there will be Wisconsin COWS grazing in Alabama in October. 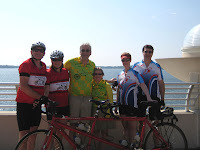 Following the meeting, the Petersons and Veerkamps got together to make plans for the Post-STR Natchez Trace tour. 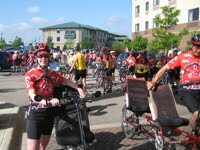 We will be calling upon our new COWS members from Tennessee to not only join us along the Trace but offer suggestions of getting the most out of biking the Trace. 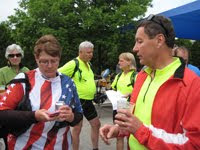 Dennis and I spent some time greeting riders as they registered and prepared to ride the Friday route created by Bill Hauda, rally organizer. 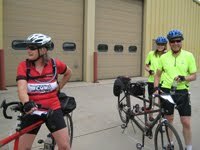 After visiting a bit, we set off on the route with new friends Tom and Annette Esser. Dennis and Ingrid also joined our happy little group. As we neared the town of Cross Plains, the Essers informed us that their relatives had a small brewery in town and asked if we'd like to stop in for a visit--"of course we would" was the reply from all. 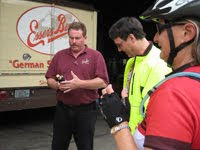 Tom's cousin, Larry, spent some time telling us the history of Esser's Best Brewery and all was quite interesting. 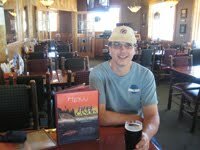 Larry is the 6th generation of Essers in the beer business which was started by his great...grandfather George Esser in 1863 on the same property it is on now. Larry was a very gracious host and provided this thirsty group with beer to sample. We said goodbye to Larry and found our way back onto the mapped route. We reached Middleton in time to meet up with the rest of the herd enjoying the Capital Brewery. 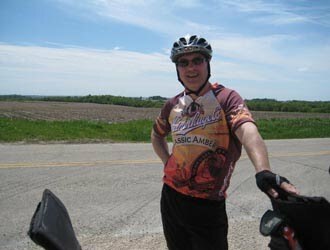 Our jersey choice for today's ride, Leinenkugel's, caused many to mark us as traitors but we never thought we'd find ourselves at 2 competing breweries when we made this choice. 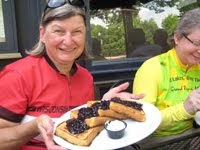 While visiting with other riders, the topic of food came up. 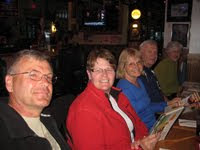 The Essers suggested the Quaker Steak and Lube and since they are local to the area, we accepted their advice and called ahead to hold seating for 8 couples arriving around 8:00 p.m. I planned that right down to the number as 16 of us walked into the restaurant at 8:00 sharp. 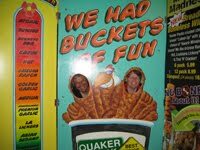 The business was themed to represent an old lube station with memorabilia throughout--a real treat for all. Couples in attendance were the Johnsons, Essers, Whites, Hughes, Browns, Petersons, Millers and the Veerkamps. 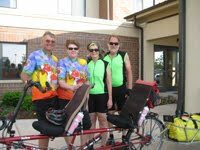 We had a wonderful time and made it back to the hotel and into bed by 10:00 p.m. to rest up for a long day of riding ahead. 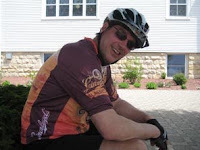 Today's ride almost did not take place as the skies at one time were threatening rain. 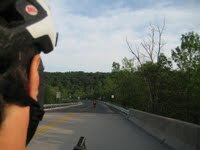 It was cloudy throughout the ride but no rain came making it a very enjoyable 20+ miles. 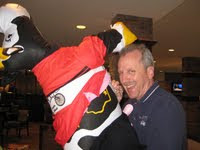 We left home at 8:00 a.m. for the 3-hour drive to Middleton, WI near Madison for our 5th spring rally with the COWS. 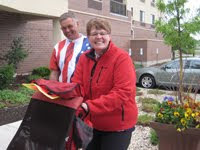 As we pulled into the loading bay at the Marriott, Kathi and John Johnson were there to greet us. We made some quick plans to meet up for a lunch ride once we were registered into the hotel. 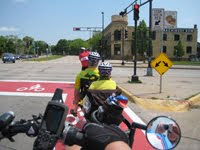 As we biked around Middleton, we came across a quaint Albanian Café called SOFRA Bistro (www.sofrabistro.com) and who should we see climbing out of their truck with tandem in tow but Dennis and Ingrid Hughes just into town for the tandem rally. We invited Dennis and Ingrid to join us for lunch and we all enjoyed our meal choice. My Albanian Wedding soup was the best soup I had ever had! 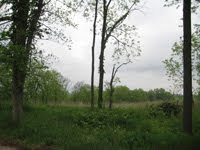 After lunch, we enjoyed the new Conservancy Trails around Middleton. 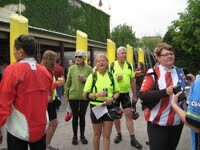 We then biked back to the hotel to register for the rally and watch all the couples arrive and get ready for the official route for the afternoon. No speed records today but we sure had a great time. 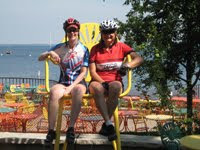 Our ride began from home with plans to pedal to Rushford for lunch at Stumpy’s. 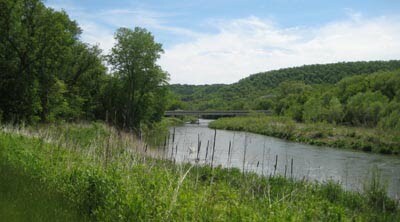 We biked the roads to Peterson where we picked up the Root River Trail to continue on to Rushford. The sun shines down for another wonderful biking day with temps in the 70’s and winds blowing out of the SE—thank goodness we would have the wind to our backs on our return trip. Lunch plans in Rushford changed when we waited 15 minutes at Stumpy's and still no waitress acknowledged us. 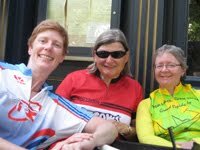 We got up, left and pedaled down the block to try a new pub called Shawnee’s. We enjoyed it there. The food was satisfying and the waitress was at our table the moment we sat down. 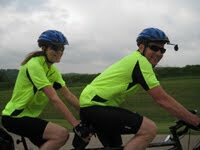 After lunch, we had to talk ourselves into getting back on the bike as we both knew what lie ahead for us—the mountainous climb out of Rushford! 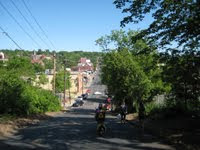 This is a 500-foot climb to the top but we did it saving a wee amount of energy to make it the rest of the way home. Now for a well-deserved trip to the hot tub!